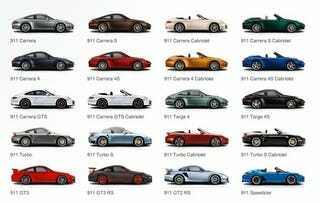 Car, the self-evidently-named UK buff book, has joined our plea for Porsche to stop the overcomplication of the 911 range. With a Mustang-like 20 flavors available (22 in total), Porsche is beginning to look like Baskin-Robbins. Something must be done! Agreed. What's next? All we know is we're sick of seeing a new 911 every week (or 49 days as it were) — mostly because each new special edition 911 just makes the rest of the special editions feel less special. Sure, we know you want to make 911 customers feel unique — but if everyone's unique, doesn't that just make everyone the same? But do we know? Porsche is obviously selling them — and at a profit. And we still love each and every one of the adorably awesome "arse-engined" sports cars — we just wish it weren't so hard to keep track of them all.